For by the grace given to me I say to everyone among you not to think of himself more highly than he ought to think, but to think with sober judgment, each according to the measure of faith that God has assigned (Rom 12:3). You adulterous people! Do you not know that friendship with the world is enmity with God? Therefore whoever wishes to be a friend of the world makes himself an enemy of God. Or do you suppose it is to no purpose that the Scripture says, “He yearns jealously over the spirit that he has made to dwell in us”? But he gives more grace. Therefore it says, “God opposes the proud, but gives grace to the humble” (James 4:4-6). The fear of the Lord is hatred of evil. Pride and arrogance and the way of evil and perverted speech I hate (Prov 8:13). A disciple is not above his teacher, nor a servant above his master. It is enough for the disciple to be like his teacher, and the servant like his master. If they have called the master of the house Beelzebul, how much more will they malign those of his household. So have no fear of them, for nothing is covered that will not be revealed, or hidden that will not be known. What I tell you in the dark, say in the light, and what you hear whispered, proclaim on the housetops (Matt 10:24-27). Atheists love to charge those who believe in God with arrogance. It is arrogant, they claim, to believe that God has chosen you, that God speaks to you, when so many others don’t hear Him, or they hear differently. They say that it’s tremendously prideful to say that the Creator of the whole universe bothers to talk to someone as small and insignificant as a single human. 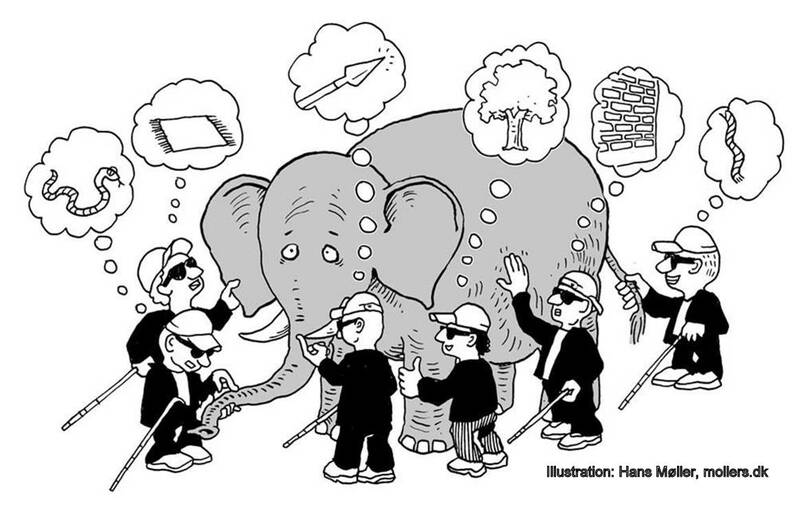 There is even, among pluralists, the illustration of the blind men and the elephant. One blind man feels the trunk and says that an elephant is like a tree branch or a snake. Another feels the tusk and says an elephant is like a spear. Another feels the tail and says elephants are like a rope. Another feels the side and says an elephant is like a wall. And so on. They all disagree vehemently about what an elephant is, though they’ve all experienced the elephant. This illustration is very often used to claim it is arrogant to say anything for sure about God because God is too big to be known. One person’s experience of God is very different from another person’s; they’re both authentic, but they’re both contradictory, only parts of the true whole. How silly of blind men to claim they know such a big thing based on their experience! Yet this illustration is itself arrogant. It presupposes that you can see the whole elephant. You are the one who is not blind. Those who use this example are behaving in the exact same way as the blind men, making firm statements about the reality of God and claiming everyone else is wrong. They, they believe, are the ones who see clearly! It also presupposes that God—the elephant—is entirely passive and uninvolved in the process. The blind men create their viewpoint around what they take from their experience with the elephant; the elephant never reveals itself. Likewise, people create their religions around what they take from their experiences with God, and God never reveals Himself. This does not account at all for our God. Our God reveals Himself. Our God engages us. He speaks and we listen. Our God is not someone we have to feel out and make our religions around based on our observations, but Yahweh comes to us, opens our eyes, and shows us who He is. We cannot learn all, for we cannot comprehend the unlimited God with our limited minds and eyes. But it’s much better than feeling around in the dark for something that doesn’t bother to communicate with you! Now, there is a grain of truth to these arguments. There are Christians who are spiritually arrogant. Any one of us can fall into this trap from time to time. But that doesn’t disprove who God is. But they did not receive their inheritance because of their merit. They did not earn their inheritance; they do not deserve it. They received their inheritance because of who their parents are, not because of who they are. It is likewise with us. God did not choose us because of who we are; Yahweh chose us because of who He is. You can never earn your place as an heir in Christ, and you all know this. But sometimes you forget, and you lord your inheritance over others. But you can never earn your inheritance from God, and God also wants to give everyone else an inheritance, too. As I said in the article, “The Altar of the Unique,” you are special to God, and so is everyone else. Spiritual arrogance is not a flaw in Christ, but a flaw in the Christian. And of course we’re flawed: being flawed is a prerequisite for needing Christ. You don’t need a healer if you aren’t sick; if you’re not broken, you don’t need fixed. And all humans are sick and need a healer. All humans are broken and need fixed. Again, God did not choose you because of who you are, but because of who He is. Those who hate Christ will always charge His people with arrogance when we talk of Him. Because they seek to discredit us, so they can discredit Him. But it is not arrogance to proclaim the truth of Christ. Rather, humble yourself before Christ, for He commands you to speak it boldly! Shout it from the rooftops, where all can hear!